I am currently addicted to this Twitch channel called Salty Bet, which is an online channel that streams various fighting matches between random characters. It’s kinda of like watching Street Fighter on steroids, but the thing that makes Salty Bet so entertaining is that you can bet fictional money (Salty Bucks) on the fighter that you think is going to win the match. Its total silliness where X-men’s Wolverine could be fighting a giant rainbow trout named Primeus and you can bet all this fictional money on this hilarious fight. It’s funny because you actually end up caring about the nonsense . Be warned, Salty Bet is a total unproductive time waster and the chat that goes on during the matches is downright ridiculous. Seriously such a good time! Now to my point, I think that Adebisi Shank’s new album This is the Third Album Of A Band Called Adebisi Shank would serve as a perfect looped soundtrack for all the Salty Bet matches. I’m not saying that just because there is a ton of 8-bit glitches and electronics mixed into Adebisi Shanks’ sound, but because their music is fun, powerful, exciting, random, and overall a total blast. Pretty much the exact same thing as Salty Bet, but ten times better. A little background on the band in case you’re not aware of their epicness. 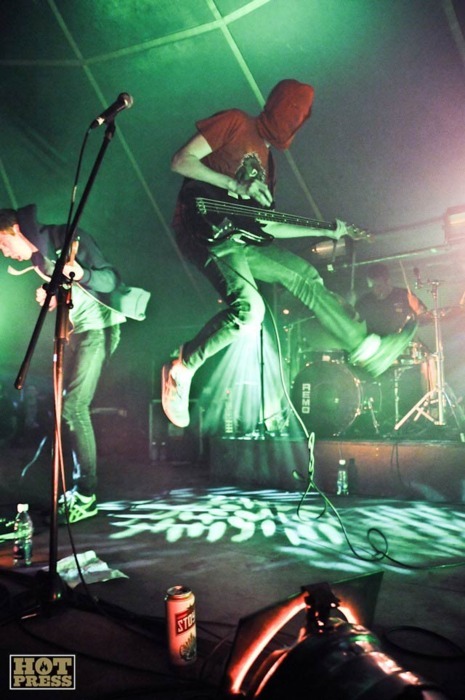 Adebisi Shank is a power trio from Ireland consisting of Lar Kaye on guitar, Vinny McCreith on bass, and Mick Roe on drums (I have a feeling that each band member does more as far as electronics and vocals go). The band has been around since 2006 and This is the Third Album Of A Band Called Adebisi Shank is actually their fourth overall release, but as you can guess from the title their third LP. The band is categorized as instrumental, but there are plenty of effect laden vocals throughout the songs on this album. The band likes to refer to themselves as “robot rock.” A genre label that I really dig and seems fitting to their sound. 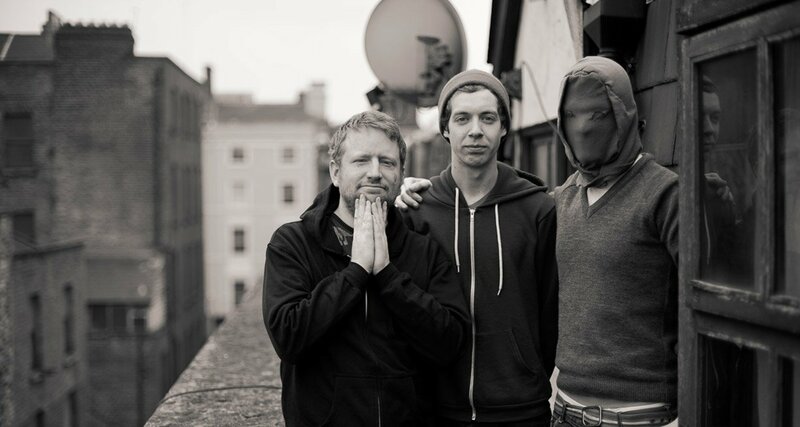 Another notable thing about Adebisi Shank is McCreith likes to wear a scarf-type mask thing when doing the band’s live shows and promotional stuff. Apparently he does this because the dude is so good looking that he might start a riot! Back to the music, when I mentioned earlier that This is the Third Album Of A Band Called Adebisi Shank was fun, I really, really, really, meant it. It’s like buying a pack of Pixy Sticks and a 2-liter of Mountain Dew, opening up all the Pixy Sticks and pouring them into the Dew and slamming it as fast as you can. Within a few milliseconds the chaos and high that would begin to go through your head would sound exactly like Adebisi Shanks’ technicolor thrashing. The nine track album begins with “World In Harmony” a five minute jam featuring some robotic vocals splicing in between a rocket-ship launch of happiness of just straight up crushing instrumentals and rainbow-road electronics. The joyousness never lets up throughout the remainder of the songs. The amount of positivity that comes from this album is enough to make your head pop off and the amount of energy all three members have to use to keep this powerful euphoria going on live seems like it would be intense. I have never seen Adebisi Shank in concert, but I feel like I really need to; so I can witness the trio pull off this carnival of sound in person. I imagine the band collapses from exhaustion with huge grins on their faces after every show. The highlight for me on This is the Third Album Of A Band Called Adebisi Shank is track eight “Voodoo Vision.” This song is technically the last full composition with track nine “(trio always)” being a short exhale of twinkling of electronics. The seven songs preceding “Voodoo Vision” were about as heavy as happiness could possibly get, but “Voodoo Vision” somehow surpasses the pre-existing heavy happiness overload. The sugary pummeling from the drums / bass and the Skittle-shredding of the guitars / electronics is so insanely good. The element that makes this song standout from the rest though, is the super mellow breakdown that comes around the 3:15 mark. It’s one of the few times during the album that Adebisi Shank gives the listener a chance to catch their breath. The thing is though, is I didn’t want to catch my breath. Once the positive pounding let up I immediately missed it and while the breakdown is pretty cool, I couldn’t wait for the chaos to return. Thankfully it did and the band finishes with one last blast of celebration thrash-metal confetti. This album is impeccably recorded, mixed, and mastered. It just sounds so huge and I am sure a lot of it comes from the song arrangements and instrumentation, but the shear power that these tracks have is something you can truly feel. There are other bands out there who have made really great albums full of positive and heavy music, but Adebisi Shank have made an album that in my mind tops any heavy-happiness I have heard thus far. Regarding the making of the album McCreith said “We were trying to make something euphoric and huge, a universe of our own imagination that we could escape into.” and if that in fact was truly the goal, the band absolutely succeeded. So, I hereby submit my request to the Salty Bet community to have Adebisi Shank’s latest album This is the Third Album Of A Band Called Adebisi Shank become the official soundtrack for all Salty Bet exhibition matches and tournaments. It’s the perfect for all the fun, random, fight themed chaos that goes on there. Also, I hereby request that someone take the likenesses of all three members of Adebisi Shank (or the light bulb headed muscle man from the album cover) and create characters of them in M.U.G.E.N. so that they can be used in Salty Bet fights. I would bet on Adebisi Shank every time!